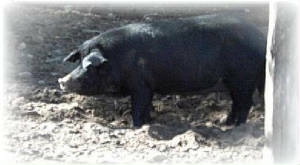 Wyoming Heritage Mulefoot Hogs - RoLyn Acres, Inc. 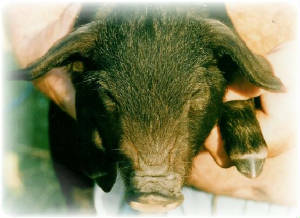 The Mulefoot pig is the rarest swine in America today. It is classified as "critical" by The American Livestock Breeds Conservancy. (fewer than 200 in annual registration). We have chosen to contribute to the preservation of this very special breed. Aside from our goal of preservation, the Mulefoot provides a gourmet meat that is highly sought after and difficult to find as it is only present in the heritage breeds of swine. A "rosy-red beefy" color that melts in your mouth. When you combine both the paramount meat quality and the exceptional temperament of the Mulefoot, these qualities simply make this breed a joy to own. Have purchased all of Mr Holliday stock, he no longer has any available. The McFarlen's now have the largest herd of purebred Mulefoots in the country. We purchased our foundation stock from Maveric Heritage Ranch. purebred stock in the country today! that comes to an average of more than one a week." 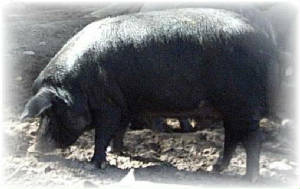 Coburn describes Mulefoot hogs as mainly black, with occasional animals having white points; medium flop ears; and a soft hair coat. The hogs were of fairly gentle disposition, fattened quite easily, and weighed from 400-600 pounds at two years of age. 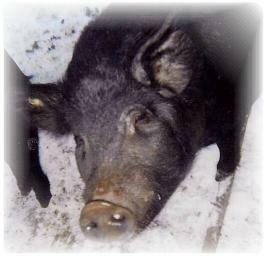 They were considered the highest quality "ham hogs" & and were fed to great weights before slaughter. For some years breeders claimed that Mulefoots were immune to hog cholera. That claim has been disproved, though the breed does seem to posses remarkable hardiness.